Take a look at the new welcome sign. 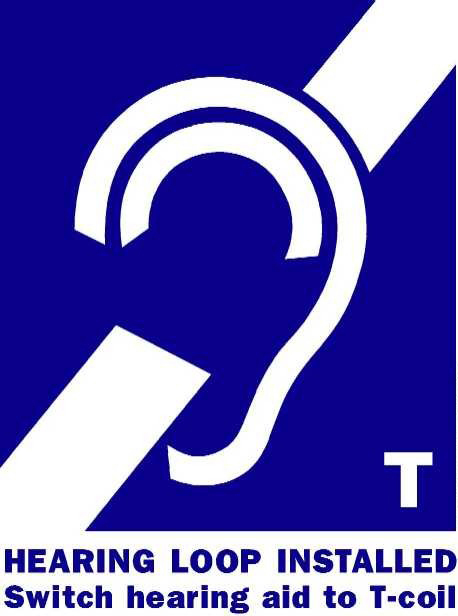 This international symbol of accessibility is used to designate availability of an assistve listening system, and the “T” identifies it as one that will directly interface with a T-coil in a hearing aid or cochlear implant...basically, it says a Hearing Loop is available, and if you need assistance with hearing, you're welcome to hear! Placing this sign at the entrance to your establishment is a welcome sign to the 47 million Americans with hearing loss. The Americans with Disabilities Act document: Standards for Accessible Design, not only outlines the assistive listening system requirements for public facilities, but emphasizes the importance of the companion signage and placement. These signs say welcome, you care, and provide assurance to anyone who needs hearing assistance that you have provided access for them. But here's the real question; Why do I see the sign for WiFi accessibility everywhere, and not the new welcome sign of accessibility for persons with hearing loss? Maybe WiFi is a perk, I mean I use it all the time and appreciate the availability, but is it a real decision maker when choosing what you want to eat? Could we stand to realign our priorities just a little bit? Nearly twenty percent of our population should not have to make choices based on accessibility, but they are! As a society we accommodate the techies, we accommodate the foodies, the coffee snobs, the dieters, and it's appropriate that the physically challenged will always have a place to park....so why are we not accommodating members of our community with hearing loss? I hope that's changing! Here's my thought; If you have difficulty hearing at an establishment, ask to be accommodated, it's your right. If you operate a public establishment, then please listen. Do the right thing and become ADA compliant. Be pro-active and lead your industry by inviting the community into your loop!